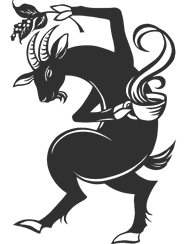 Literally, “Dance of the Goat”. This curious piece for solo flute is meant to illustrate a goat dancing on a grassy hill after the winter snows have melted away. It was written in 1921 by Swiss composer Arthur Honegger as incidental music for dancer Lysana of Sacha Derek's play La Mauvaise Pensée. However, the original manuscript of this piece has been lost. The editions that are out now were derived from a partial transcript found in Honegger's transcriptionist's works. The piece has been worked on by historians to be as accurate as possible. The piece starts with a slow dreamlike introduction consisting of tritone phrases. This soon unwinds into the “goat-like” theme in a chromatically altered F major in 9/8 that skips along providing the lively picture of a dancing goat. Following this theme is a lighter songful melody, which brings a more calm feeling and leads to the reiteration of the initial dreamlike idea. The piece finally ends on a soft, fading C for resolution.